One of the most popular cosmetic dentistry procedures is porcelain veneers. Why? Because by simply covering imperfect teeth, you can have a perfect smile after only two appointments. Where there used to be unsightly teeth, there can now be white, well-formed and perfectly straight teeth. Using porcelain veneers in Weyauwega, Dr. Twohig has transformed the smiles of many people in the area and he can do the same for you! Whether they are called porcelain veneers, dental veneers or just veneers, the benefits are all the same: teeth that are more attractive so your smile makes you happy and confident. Veneers are made of a paper-thin—but very strong—pieces of fine dental porcelain that are adhesively bonded to the facial side of your teeth. Of course, your natural teeth are still there, acting as supports for the veneers. Therefore, a strict at-home oral hygiene routine is a must to ensure the health of your new smile. Daily brushing and flossing, as well as regularly schedule dental checkups, are essential to ensuring your oral health when you have veneers, as well as the appearance and longevity of your new smile. Who is Good Candidate for Porcelain Veneers? Most people are qualified to have porcelain veneers. However, your cosmetic dentist in Weyauwega will want to conduct an oral examination first to ensure your overall oral health before placing veneers. 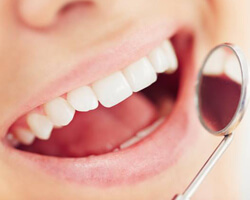 The dentist will check for signs of cavities and periodontal disease, either of which will need to be addressed before any type of cosmetic dentistry plan begins. Porcelain veneers are often suggested for moderate cosmetic concerns, such as chipped, slightly cracked or broken teeth. Other cosmetic flaws that veneers can conceal include teeth that are misshaped or too small, as well as teeth that have gaps between them. How Do I Get Porcelain Veneers? Porcelain veneers can usually be placed in just two appointments. At the first, your teeth are prepped. Dr. Twohig must slightly reshape and resize your teeth in order to make room for the veneers. To do this, he removes a very slim layer of enamel. After this step, you’ll be given a temporary set of acrylic veneers. These protect your prepared teeth and give you the chance to adjust to the feeling of veneers in your mouth. When your handcrafted porcelain veneers arrive from the lab, you’ll return to see Dr. Twohig so he can bond them to your teeth. With a little extra care, you can expect your new porcelain veneers to last for about 10 years before they need replacement. You can help extend the longevity of your smile by not using your front teeth to bite hard foods such as raw carrots, nuts and ice. This way, you’ll enjoy your beautiful for many years!